My bread postings are soooo long overdue. It's time for me to flood you all with my breads. But don't worry, breads won't run for a month straight. But I can do bread month's' if I want to. It's crazy, as usual, that's me. This is not my first loaf.. I made a few loaves before this and I just wanted to post white sandwich loaves first. 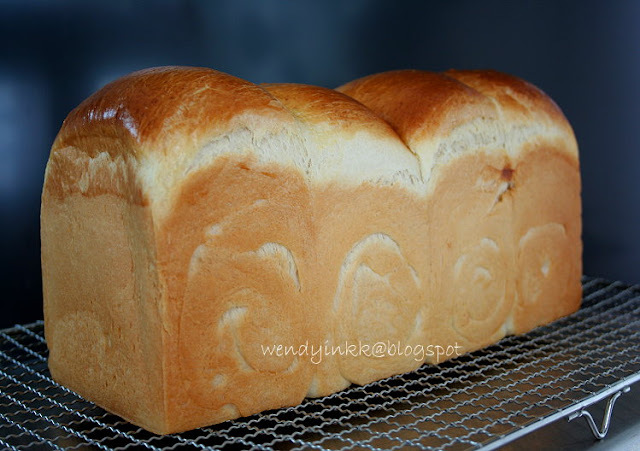 Hokkaido Milk Loaf.. took the blogosphere by storm few years back. I was already around, snooping around other's blogs but never ever thought that one day I get to try making this because I never imagined I will one day own a heavy duty mixer. Make this if you have lots of whipping cream to dispose of. But yet, you can always get a carton, separate into portions and freeze. Use each portion for each loaf of bread. It's a very nice direct method bread. 6. Let dough rise until 2/3 full. Preheat oven at 150(fan)/170C. Brush on egg wash if preferred. Verdict: Manual kneading friendly, final dough is not tacky, but very workable, texture is very soft, beautiful crumbs, soft for 2 days. Crumb turns crumbly on 3rd day, best if reheated but still fine if eaten just like that. Very soft loaf. I attempted it once without success. Maybe should give it a try again. oh dear.. look superb... must try ..
Oh you finally decided to post up all your loaves! Looking forward to seeing them all! Nice loaf of bread from all angles! Yummy! I've tried this a few times without much success. Sigh. Will have to find the courage to try it again. I always admire to those who made their own bread because homemade bread is always the best and healthy! Your bread looks so beautifully made! Bravo! Just when I thought I will take a bread break, there you are tempting me with this fluffy bread. Now I can feel the bread bug biting me. 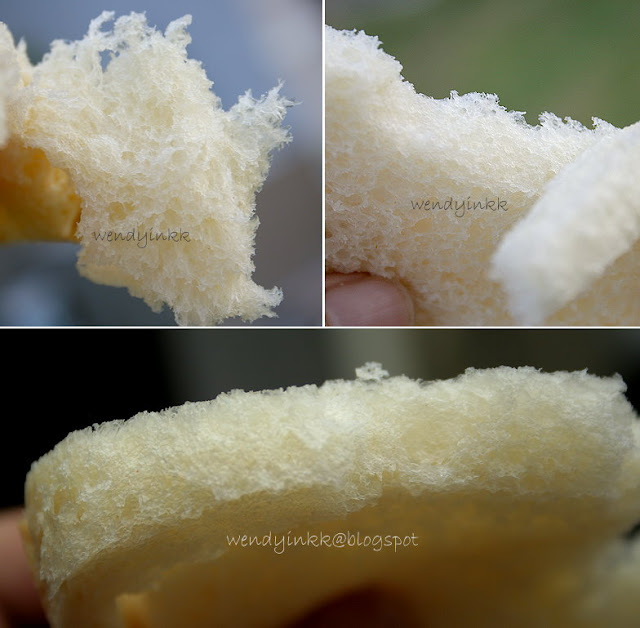 Nice texture, soft and fluffy bread! Yeah, this is my favorite!! 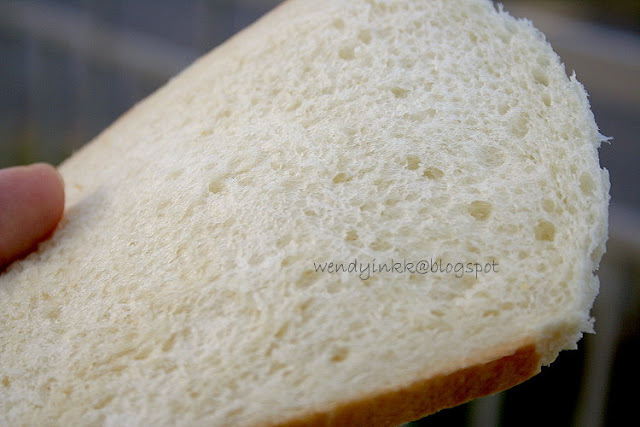 Wah.... Wendy your bread looks so soft and fluffy. Very beautifully baked, thumbs up. I just bought a litre of cream, look like time for me to make this loaf. Both you and Shirley made a nice Hokkaido loaf. 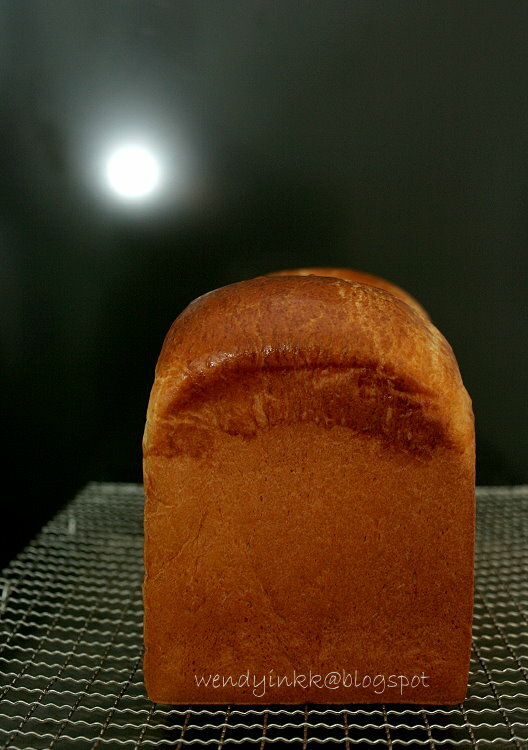 havent tried this hokkaido loaf. I'm sure you're good at baking breads now...looking forward to all your bread! oh here comes the bread! Oh! I cant wait to hv a bite! Oh my, your bread looks lovely. So soft and fluffy, just like a pillow of cloud. Wish I could have a slice. And excellent photography skills! LOL, no problem, I could understand, the bread got you so excited you jittered and created a typo. I think I'm pretty much opposite of you. Ur recipe will be on Wendnesday! Oh what was the problem? LOL, not everyone thinks like u, and one of them is my hubby! I had the same experience too. I knew that posting about boycotting or whatever won't work because they have a certain software to download everything inluding the labels and the labels link back to us when we click it. Funny man! With ur KA, this shouldn't be a problem. It's manual kneaders who always have problems, which is why I dun bake much bread before my KA got on my counter. It's pretty much a straighforward bread. Window pane stage is the point when you bread dough can be stretched thin without breaking. Some call it membrane stage, it's the same. Just take a small piece of the dough and stretch it, it will look like roti canai and won't break, if it breaks it should break with a circular hole, not a straight hole. Keep the fire burning, bread is life! LOL.. u sure u won't get bored or not? Wendy, I have never been sucessful using the KA to knead the dough. The dough tears easily and it don't reach the membrane stage . Hence I used my Z breadmaker to knead the dough but need to do 2 circles. Hey congrats to your latest conquest. I told my sis that you will surely win cos" she is talented mah". Huh? Not been able to do with KA? Surprising, knead it for 15-20 mins on speed 4, sure can one woh. If speed 2 for 10 minutes as said in the recipe books sure cannot. If it needs 2 cycles inthe bread maker, then for sure it needs some time, even on KA. Thanks but then again, I was lucky also la. Wendy Wendy, do you have a recipe for kaya? Not the greenish looking type but the brownish type which I used to buy in bread/coffee shop in Kampar last time. Sons love kaya toast whereas I eat with steamed glutinous rice. I love bread, would love to make my own but no success yet, my problem is always the yeast rising thing. Not risen at all! Your bread looks yummy! First, let me congratulate u for winning the M'sia's Master Chef Blogger Award. I agree with u that it was a hard chore to make bread before I invested in my most expensive pc of kitchen gadget which is a powerful 1400 watts stand mixer some 2 months ago. Now making that perfect loaves and bread buns is a breeze to me. Like you, I bought my stand mixer for the purpose of bread making. I am pleased that my stand mixer performs easily and perfectly well in kneading my bread dough till window pane stage. Thank you for sharing the Hokkaido Loaf. If u do have bread recipes which use 100% whole wheat flour (Atta), I would appreciate if you could share. I guess breads made with a portion of 100% whole wheat atta flour is softer than wholemeal flour. Are u kneading with hand or machine? If you're kneading by hand, please dissolve the yeast first in water before use,if not it takes double the time to rise, seriously. If you're kneading with machine, it's fine to use it direct. So funny, never rise? I am planning to experiment with Atta flour, but not at the moment. Waiting for my MIL to be back from the States so that there will be someone to help eat it. The grains are more finely milled than regular whole meal flour, so it could be softer, but there are some organic shops that sell finely milled whole meal bread flour. If I can get that in Malaysia, I'm sure you can get that too in Singapore. For our Malaysian weather, just counter top will be fine, unless your house is fully air conditioned. I find active dry yeast to be more temperamental. Very susah one, sikit sikit, dun want to rise, mix with milk and not water, then make fuss oredi. Slightly too hot, die oredi. I will never buy another packet of active dry yeast, but then again, it's hardly found here, I got mine from US, just for the fun of it because my MIL raves about it. I use instant yeast mostly and it depends on the recipe, one recipe on my blog is horrible when it comes to proofing time, but it's very soft due to the high fat content, that's the "wonderfully soft bread". But other than that, I don't have much problems with instant yeast, but I do find some brands being more sugar tolerant than others. There is one brand that I used, when comes into contact with high sugar amount, gets retarded. But I'm not sure whether that's a one off event, I do hope to try that brand again with the same recipe. Haha, dats why I probably messed up the steps somewhere....but I followed the recipe exactly and it didn't rise. Don't have a lot of experience with baking bread to figure out what's wrong yet. But will try this recipe of yours. You know where I can get dry active yeast? I'm still new to bread baking too, although have been making pau for quite some time. I dropped u a question last week but dunno y it wasn't published. Anyway, forget abt tat qn cos I went to buy a bread tin juz to try out this recipe! As my oven is small, I bot a tin of dimension 5 x 5 x 7.5. It's half the length of the tin u used. Does tat mean I can halve this recipe? Appreciate yr advice cos it my first time baking bread. I hope it turns out well! TIA. Last week? Which post was it? I don't remember getting any comments regarding bread last week. Yes, half the recipe please. I think I posted around late night on 7th. Oops.. that's nt last week but earlier tis week. Lost track of time, sorry. I actually asked if I can use loaf pan to bake this but I went to buy a bread tin instead. I just saw ur lastest posting using two loaf pans. How innovative!! So using loaf pans to bake bread is possible afterall! I take my hat off u for being able to think out of the box everytime. Thankyou for the feedback, glad you enjoyed my recipes. I have no experience in using a breadmaker, but is your bread kneaded until window pane stage? Hi Wendy. I don't think the program I used kneaded the dough until the window panel stage. Maybe I will try using another program the next time I do it. Additional 5 mins knead. Thanks for your feedback. Gen.
Knead by hand or machine? There is one picture in my split top butter loaf. from what I know, most ppl will do double kneading cycle with bread maker, which is 15 +15mins. Next time if you don't have time to work with your bread, throw it into the fridge to halt the yeast. The long hours fermentation took over the kneading process as it also developed gluten, but at a much slower pace. I'm not sure which function you used, but try to knead it twice with dough function and compare the results. If you kneaded your bread sufficiently in the first place, 5 hours of 2nd proofing will give you a flat bread instead of a fluffy one, because it would've over fermented and collasped. Hi Wendy. I made the bread yesterday following your suggestion by doubling the kneading cycle which is 25+25 for my bread maker. Took out dough & left it to proof for an hour+. Then divide into four, flatten, roll them and placed into the loaf baking tin. I let it proof for 2 hours. After baking for 1 hour, it comes out perfect. Thanking so much for your advice. Lately the weather's a bit cool, I find my breads take longer than one hour to proof too. If you want it to proof in your machine then let it be. Up to you. It's just the location. BTW, run the kneading twice to get to window pane stage, that's what I hear from my friends who use the breadmaker. One cycle of kneading won't get to the window pane stage. You will need twice. 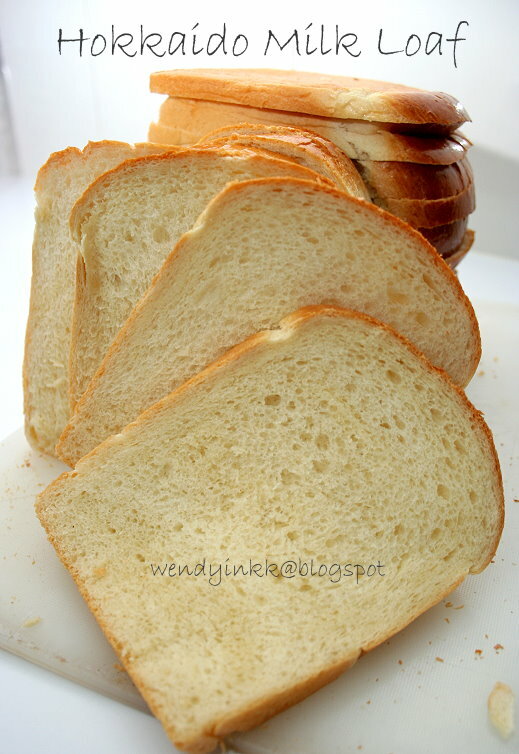 I have tried out this recipe and it REALLY yields a soft & fluffy bread loaf! Thanks for sharing! But can i know why my bread loaf has yeasty smell? Hmm... overproofed? Or maybe used too much? since i m using the Pullman tin for baking this loaf, i waited until it reaches 90% of the tin height...err...it takes abt 1.5hrs ...issit overproofed?? that does seem too long. for this bread, I only let it go to about 75% full when i pop it into the oven, about 2/3 when I preheat the oven. That looks really good. I'm planning to make it but I only have multigrain bread flour. Will it change the texture of the bread if I use multigrain bread flour instead of just regular flour? Thx! This is just a white bread loaf. Hi Wendy, may I know which method is better, using the tangzhong method or the 17hrs fermentation method in making bread recipes of any type or just specific types of recipes. What about coconut bun?Thanks. Seriously, nowadays I don't really go into all those fancy methods. A well hydrated dough that is sufficiently kneaded will give wonderful results that has softness that can last just as long. Hokkaido Milk Loaf has cream.